HEXIS DESIGN provides one of the most complete software solutions to create paint & lights protection film kits as well as solar film kits. You can both cut or create your own precuts and use a great number of available precuts. HEXIS DESIGN offers an extensive vehicle database which has been developed to keep pace with the needs of paint protection and solar films markets. HEXIS DESIGN is available on a monthly subscription basis. 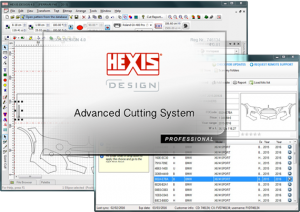 In order to subscribe to HEXIS DESIGN software you will need to fill the registration form that you can find here. You will shortly receive the debit authorization form that you have to return to contact@hexis-design.com The deposit price for the activation key will be debited from your account. You will get the activation key upon receipt of your payment. The key will allow you to activate the software. Your subscription starts from the date of your first connection. The subscription price will be debited on a monthly basis, starting from the date you first connect. You can now download the software on your computer and have access to all its functionalities !